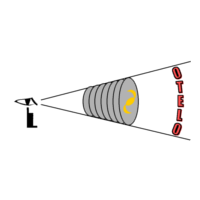 The subject of the OTELO survey are emission line targets. These objects encompasses a wide variety of objects: normal stars forming galaxies, starburst galaxies, emission line elliptical galaxies, AGNs, QSOs, Lyman alpha emitters, and peculiar stars, are some of the examples. Except peculiar stars, the emission line objects consist of galaxies. These Emission Line Galaxies (ELGs) have revealed as one the key components of the galaxy population of the Universe at all lookback times. They include star-forming galaxies, Active Galactic Nuclei, and dwarf galaxies. A deep survey for ELGs samples will provide at all the Universe epochs with observables that constitute fundamental benchmarks for all cosmological theories of galaxy formation and evolution. When the emission is due to star formation, the star formation properties as star formation rates, luminosity functions and gas metallicity can be derived for each galaxy class, and its evolution studied. Preliminary Stellar Masses for the sample of z=0.4 emitters will also provide a list of candidates to low-mass (dwarf) star-forming galaxies. The Spectral Energy Distribution (SED) of these objects will allow us to estimate their star formation history. To determine is these objects formed most of their stars very early in the universe or relatively late is a very important observational constraint to determine the best galaxy evolution model. Because of the extreme depth of the survey, some dwarfs could also be identified at larger redshifts and higher look-back times. These objects could be specially important as they are observed much earlier in the Universe, so they are closer to their epoch of formation. Also, it can be determined the luminosity function of low luminosity galaxies Otherwise, luminosity functions of different types of AGNs and QSOs, their spatial density, together with its evolution can be derived. At high redshifts, targets as Lyα emitters allow surveying the first known galaxies and structures in the universe.In our neighbourhoud Milky Way and Solar System studies are possible, as galactic structure, tidal tails, peculiar stars, Kuiper Belt Objects, etc. A list of scientific programs is being developed by the Scientific Team that is currently being formed. Moreover, even the branching of the projects presented before is wide enough to allow many other astrophysicists to be actively involved.